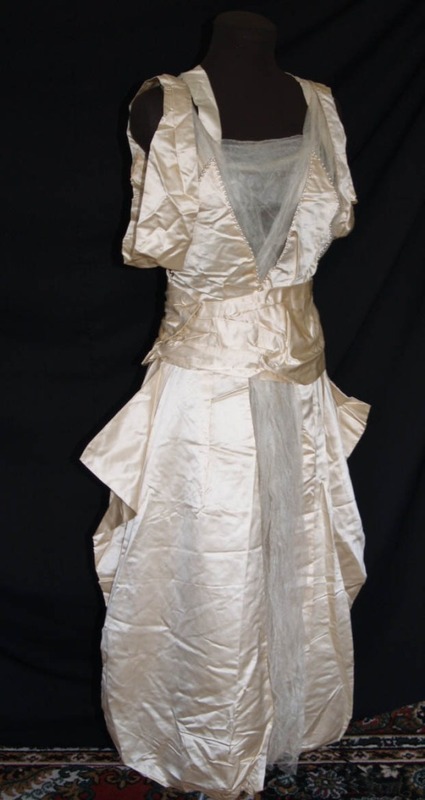 A very Aesthetic looking c.1917 lady's Party wedding dress is made from a luxurious silk satin. It came with a paper stating the name of the bride & wedding date(will be provided with the dress). It reminds me of dresses designed by Paul Poi'ret. The bodice of this one piece gown is made of fine soft net & has graceful pannier affect on the side of the Barrel shape skirt(see pic). < p>The beautiful quality silk has a candlelight sheen to it. The bodice is made of fine net with satin panels cut in Floral-petal shapes. 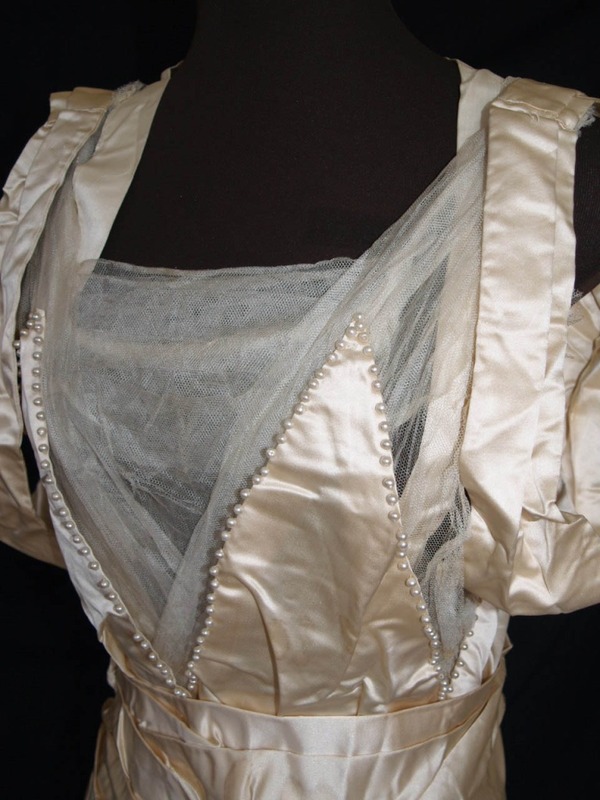 Furthermore the bodice is decorated with glass pearls(see detail pic). The sleeveless bodice has unusual shape shoulder straps. It has a large low-cut square nekline with long satin ties in the back to tie as a Bow(see pic). 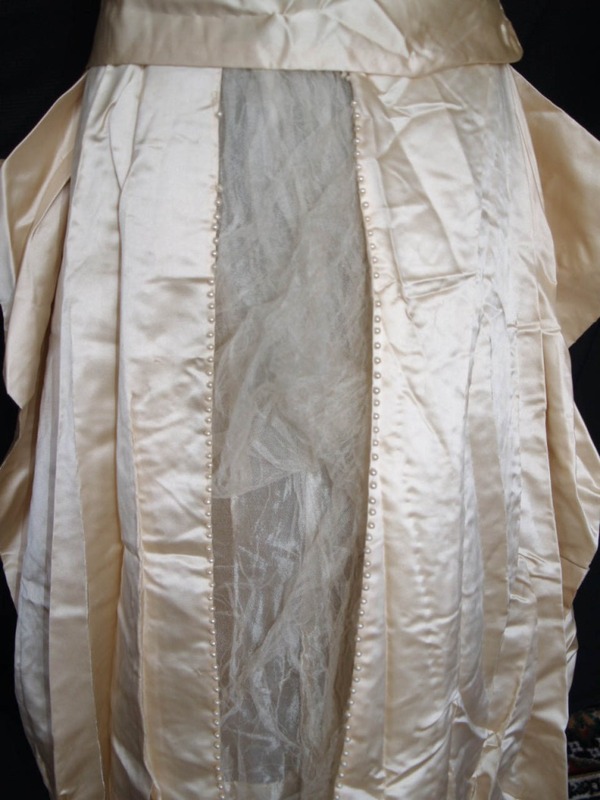 The bodice is fully boned with short stays on inside waist chincher.The skirt is cut in puffy Barrel-shape & lined with Iridescent cream silk Lame`. The center of the skirt is made of fine net & hang from the waist. The hem has metal chains stiches into it to hold its Barrel shape. The skirt is also decorated with glass pearls in the back(see pic). The entire dress is very beautiful & reminds me of Downton Abbey. The shape of the dress itself represents a very Aesthetic in fashion! The entire dress is a true masterpiece with lots of quality trim, fine handiworks & high tailoring. A 31" bust, 24" waist and 47" from shoulder to hem. In good as found condition, more suitable for pattern or display. Missing mother of pearl beads on skirt, some tears on fragile satin & netting is weak but definitely a good display piece. 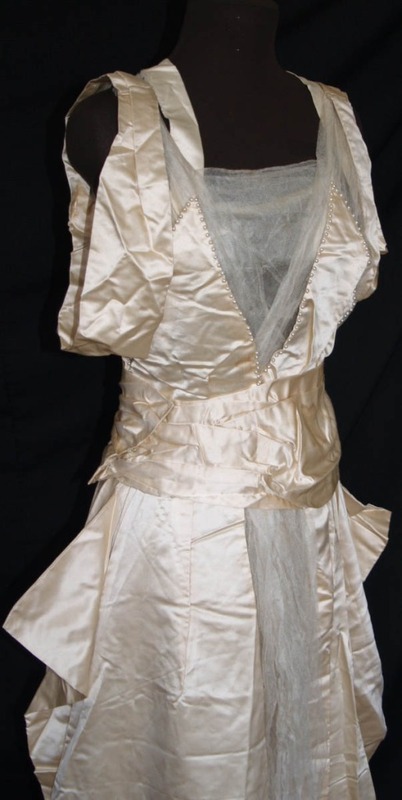 It was once a most Lavish chiffon & satin dress from the Edwardian Era!! Shipping: Domestic winner to pay shipping of $13.50-- includes delivery confirmation. Shipping to Hawaii and Alaska may be more than quoted. Payment: I accept Paypal. Terms: Payment must be received within 5 days of auction close. Check my other auctions this week for antique/vintage clothing with decorative, ethnographic and historical textiles.